How much should I save during my working years? Monday we started tacking the enormous question of “How much do I need to retire?” We dove into the first sub-question: How much will I spend in retirement? Now we’re going to take on the next question: How much should I save during my working years? Then tomorrow we’ll bring it all together by answering the third question: When can I retire? Let’s start talking about savings. We know that savings is the fundamental ingredient in investing and we know that starting early provides a great advantage. We’re going to use the example of my cousin, Skinny Fox. Skinny is 22 years old, just starting out with a $50,000 per year job. She expects salary increases of 5% (a little more than inflation) and she’ll eventually top out at a salary of $150,000 per year (in future dollars). 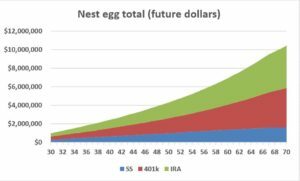 The first place to start when thinking about your nestegg is Social Security. That’s the “forced” savings plan the US government makes you do. It’s complex and there is a lot of nuance, but basically they’ll take 6.2% of Skinny’s income (plus another 6.2% from Skinny’s employer) over her working career. When it’s time to hang up the spurs, she’ll get a monthly pension. So in a very real way, Social Security is your first “savings” method. Unfortunately, the rules for Social Security aren’t very straight-forward when it comes to figuring out how much you’ll get based on how much you put in. However, it seems reasonable that a middle-class fox like Skinny will get a middle-class payout from Social Security like $2,000 (in today’s dollars) per month starting when she turns 67. For Social Security, when Skinny “saves” her 6.2% of income ($3,100 in her first year of work), that gives her a pension that will be worth about $450,000 in today’s dollars; that’s about $1.6 million when Skinny turns 67. When Skinny Fox was looking for her job she knew how important it was to consider the company’s benefits beyond just the salary. Her company offers a 401k and matches $0.50 for every dollar up to 6% of her salary. Skinny knows she should max out her 401k because of tax reasons, but that’s just not realistic for her, so she just contributes the 6% to get her company match. Her first year she contributes $3,000 to her 401k and her company kicks in a $1,500 match. Over her entire career her 401k will steadily build until she turns 67 and it’s worth about $1.9 million (in future dollars)!!! Skinny is a nervous soul whose father fox always taught her to save, save, save. She knows that she can contribute to an IRA, after reading this blog she knows it should be a traditional IRA and not a Roth, with $5,000 per year. 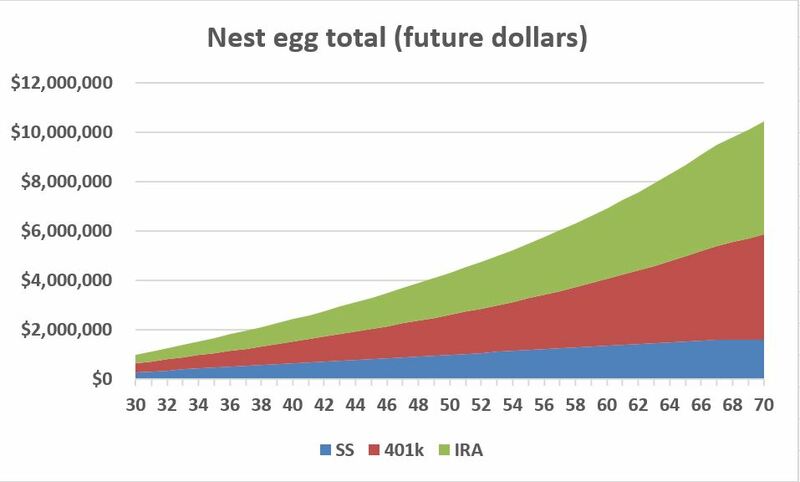 When Skinny turns 65, that IRA is worth about $1.2 million. If she’s still nervous, she can save in a regular brokerage account that doesn’t have the tax advantages of a 401k or IRA. Each $1,000 per year she saves equates to about $200,000 when she turns 65. This really illustrates the power of compounding. I’m not saying that $3,000 per year for her 401k or $5,000 annually for her IRA isn’t a lot of money. Especially when she’s first starting out—it’s definitely a lot. But $8,000 doesn’t seem insurmountably unrealistic for Skinny. Each year after that it gets a little easier. However, the payoff seems huge. Slowly and steadily, over her 43-year working career, her 401k will have steadily grown to $1.9 million and her IRA to $1.2 million. She’ll also have a backstop of Social Security which would have a lump-sum value of about $1.6 million. Combine all those, and she’s got a nest egg of about $4.7 million in future dollars (about $1.3 million in today’s dollars). That certainly seems like a lot, but is it enough? 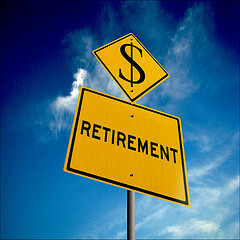 We know from yesterday’s post that $1.1-1.6 million is right in the range of a pretty decent retirement. So Skinny’s there just based on her 401k, IRA, and Social Security. The good news is that doesn’t include any home equity she builds over her adult life, extra savings just from making more than she spends, or any inheritances or other unexpected windfalls. So maybe there’s some cushion there. On the other hand, she maybe she shouldn’t feel especially comfortable. She has a clear path to $1.3 million and she’ll need $1.1-1.6 million. That’s definitely within the margin of error. What is a vixen to do? Come back next Monday for our final installment of this blog mini-series where we bring together what you’re going to spend in retirement with how much you have saved for retirement, and we’ll see if it all works.